Labour have accepted that they laid out the WCA and in fact started it. They have had five years to see how it has gone wrong. 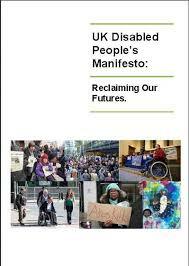 They have had five years to realise that the number of disabled claimants was at the right level. They need to promise now and loudly what they will do when elected and keep to it. The bottom line with the WCA is that it has resulted tens (if not hundreds) of thousands of unneccessary deaths, as well as turning the already challenging daily existence of millions more into a living hell. The WCA kills. And history will show that ESA/WRAG has also driven many more people off benefits into early graves than it ever found sustainable jobs for. Labour needs to pledge to END the murderous UNUM-led ‘work for all’ dogma, and stop the harrassment of those whose doctors have classified them as unfit for work. The sick and disabled must be guaranteed unconditional support for as long as their condition lasts, including indefinite awards for permanent or long-term conditions. The reasons for this will become obvious when the full horror of the Atos death-toll is eventually exposed, and the legal claims start piling up and then dragging on for as long as they have for Hillsborough. Atos and WCA were Iain Duncan Smith’s horror show, yet we are seeing increasing media gibes about how it was LABOUR which orginally introduced them. Labour needs to wash the taint of blood from its hands fast, and demonstrate some will and commitment to rebuilding the lives shattered by the carnage that has ripped through the disabled community. I feel that those who have ‘Indefinite’ DLA awards should have those honoured. Thinking about mental health, given 70% of working age service users are unemployed, to be realistic about this – voluntary work that people chose to do (or can undertake) must be an additional outcome to paid employment or being too sick to work at all. With such a high statistic, and the inflexibility and conditionality within the welfare system – this in no way supports inconsistent working ability, or not being able to work enough hours to claim WTC. Suggestions of JCP’s hassling part-time workers and those in receipt of HB will ensure that less people make the transfer into employment. While eligibility for support through the social security system for people with illnesses or disabilities remains predicated solely on whether an individual is deemed capable of doing some kind of work rather than what is in the best interests of the health and well-being of that person the system will fail those who need recourse to it. It is not the case that “Economic productivity must not be the only measure of people’s worth and value,” It should not be a measure at all. People, all people and not just those claiming disability or sickness benefits, are not units of economic production The qualifying criteria should be that a person has a diagnosed illness, medical condition or disability that in the opinion of the medical health professionals who have made that diagnosis would cause the person material difficulties or put them at a disadvantage in earning a living independently or that doing so would be detrimental to their health or well-being. While help should be available for those who feel they would like to find employment or take up a volunteering role this should be the decision of the individual and not a matter of coercion by the DWP. It should also be accepted that it is unrealistic to expect a large number of people will ever be able to find employment and for them support needs to be at a level which at least allows them to have some sort of life they can look forward to and not a subsistence existence of unremitting poverty and worry that even that minimal level of income will be taken away if the DWP decide thay failed their latest assessment. Graham, your last paragraph is one I would like to see the Labour Party adopt, and accept in full. I’m fed up with them pandering to Right Wing ideas, and they are Right Wing – it is draconian to even think about leaving people with no income, never mind actually doing it. The Labour Party also need to do something about their 35 MPs (out of the total of 90) who hire staff for no wages, seemingly justifying it by giving them poxy expenses.You Labour MPs are worse then the Condem ones who do it, because it is supposedly in direct contradiction to your beliefs. And I think that your final paragraph eloquently sums up what most of the convoluted human rights legislation regarding disability attempts to express. There is nothing about Labour’s response (as it appeared in the Independent) which convinces me they are genuinely committed to ensuring the process surrounding the assessment of Employment & Support Allowance claimants would be any fairer under their administration than under that of the Coalition. Their intended measures only go to show how they fail to understand that the only solution is to replace the WCA, they have suggested only token gestures of change and have expressed nothing new. (1) It’s a mere mirror of the current rhetoric aimed exclusively at getting people in to work. Unless claimants have been magically cured of all ills and disabilities, there has to be an acceptance that some claimants will be unable to work. (2) How would they guarantee a ‘central role’ – central to the assessment? or would it revolve around an unrepresentative ‘party’ which meets once every six months at Westminster and ticks all the right boxes and thus gives a false perception of participation in the decision -making process? Labour have to be bold enough to say what they mean. They and every MP in Westminster knows the WCA results are being used as a convenient political tool to vilify claimants as fakers and scroungers. The reality is millions have been tested, the numbers on the sick has hardly fallen and only a handful have been constructively helped in to work. The real results are kept a secret, yet they reveal the truth – the claimant is in the vast majority of cases entirely trustworthy in providing an account of their limitations. Labour need to say they will place an importance on listening to what the claimant says. We need to return to the days of trust, it is only the media which has convinced the ignorant as to doubts over the integrity of the sick and disabled. Every ESA claimant is signed off sick by their doctors, are we saying they are liars as well? (3) There is a complete lack of transparency over the inordinate number of decisions which the DWP are getting wrong, we’ve been hearing of the importance of ‘getting it right first time’ ever since the WCA was first introduced and yet today we continue to hear more and more horror stories of how badly Atos, Capita and the DWP goes about its assessment & decision making. over 1 million people have appealed the WCA and an undisclosed number have lodged internal requests with the DWP for reconsiderations. The starting point is to get to the bottom of the true number of incorrect first decisions, it is only once this has been established that you can start the process of assessing whether poor quality decision – making is in fact improving. Labour should commit to assessing the extent of the damage right now so it has some real solutions should it find itself in power in May 2015.